Welcome to the 2018-2019 Simcoe Region Local League season. Local League Hockey is House League Recreational Hockey for small centres. The regular season began on Sunday, September 30th, 2018 and ends on Thursday, January 31st, 2019. 3) March Break: Saturday, March 9th to Sunday, March 17th, 2019. As per the OHF Directive Body Checking is NOT allowed in Recreational Hockey. All teams play a 26 game season (13 Home and 13 away games) plus playoffs. As the number of teams in each age group varies anywhere from 6 to 24 teams, and fluctuates from year to year, the league cannot offer balanced schedules. The SRLL regular season tie breaker formula has been programmed into the season standings and these results are tracked in the W% column. For Minor Midget and Midget Divisions, All games must comprise three (3) stop time periods scheduled as per SRLL Regulation 3.3a). However, when any team is ahead by five (5) or more goals in the third period the game will proceed utilizing ‘running time’. In this situation the game will proceed under ‘running time’ unless the gap is reduced to three (3) goals, at which point the clock will revert back to stop time. The only time the clock would be stopped during running time is if an on-ice injury should occur. All penalties are running time. As of April 2016 Rep Hockey (ETA - AAA and YSMHL -AE,A,AA) allowed a 30 second timeout in regular season games under "certain" conditions. Currently the SRLL does NOT allow timeouts in the Regular season. The SRLL only allows timeouts in the Playoffs as per Hockey Canada rules. The league playoff season begins on Tuesday, February 6, 2019. and ends on Saturday, March 31, 2019. The SRLL allows timeouts in the Playoffs as per Hockey Canada rules. Final regular season standings only determine placement in Round 1. After round 1 as Series Winners advance, regular season standings only determines Home Ice advantage. The SRLL playoff tie breaker formula (Round Robins) is pre-programmed into the playoff standings. These results are tracked in the Post Season GF% column found in the POST SEASON Division Standings/Seriesexpanded results. Your initial view of the standings is NOT of the expanded standings. You need to go to the POST SEASON Division Results page, select the Series you wish to view, and click the series letter on the flow chart. The expanded standings for that series will then appear. Now you can view the expandedresults. Teams are guaranteed two rounds of playoffs. Round 1 - Feb 6th to 20th, 2019. Teams who are successful continue on the Championship flow. Teams who are not successful continue on the Consolation flow. Round 2 - Feb 21st to Mar 8th, 2019. Teams who are not successful are now eliminated. March Break (March 9 to 17, 2019) - ALL SRLL League Playoffs stop for March Break. Round 3 (Finals) Mar 18th to Mar 31st, 2019. It will be the Policy of the Ontario Hockey Federation that, when any player under the age of 19 is in the team dressing room(s) before, during and after a game or practice, a minimum of two of the following shall be present in the dressing room(s) or immediately outside the dressing room(s) with the door ajar: two team or club/association officials, properly screened or one such official and an adult person associated with the team. In the situation of Juvenile or U21 hockey the coach may use an adult player over the age of 19 to be the second adult associated with the team. The Ontario Recreation Facilities Association (O.R.F.A.) has issued a Facility Alert recommending that signage be posted that "Prohibits the use of cell phones, and personal digital assistants in all recreation facility change rooms". The OMHA acknowledges the recommendation of O.R.F.A. and directs all members to govern themselves accordingly. Please note: this next section only applies to Associations having multiple teams playing within the same division. The Simcoe Region Local League has balancing rules in place requiring Associations (with multiple teams playing within the same division) to not exceed a predetermined percentage spread specified in the constitutions policy set to keep one stacked team, from an Association with a number of teams in the same division, from running away with the division. This will require Associations to trade players among their own teams within that division prior to the November AND December deadlines each season if the winning percentage spread between the top and bottom team from that same Association is too wide, or "out of balance". Associations are required to ensure all their teams play a certain number of games by November, and again by December, so they can monitor and report to the other league members at the monthly league meetings on their progress and all steps taken to achieve balancing. All teams are to be balanced by certain deadlines, but once the teams are within the percentage spread requirement on the deadline, there is no requirement to maintain this spread after the deadline. Good coaching can improve team performance and is not penalized. The intent of the policy is simply to prevent any Association with multiple teams within the same division from entering a stacked team. Any Association with teams that fail to balance and are still out of balance by the middle of December each season will have been fined two times for missing two deadlines. Those Associations have until the end of the season to bring the unbalanced percentage spread back into balance. If at seasons end, the winning percentage spread between the "unbalanced" top and bottom same Association teams exceeds the allowable spread set by the policy, the Association is fined one final time and faces the possibility of having one or more of those teams in the division denied entry (disqualified) into the playoffs. During the 2018/2019 SRLL hockey season, within our Bantam Division all 17 teams will play a 26 game schedule. From September 30th to December 8th, 2018 the teams will play 14 games. The 17 teams will then be split and divided into TWO divisions. Tier # 1 will consist of teams ranked from 1st place to 9th place. Tier # 2 will consist of teams ranked from 10th place to 17th place. The teams within each Tier will now play the remaining 12 games of their schedule. But the teams will only play against teams within their Tier. This will allow for better competition when you are playing teams of equal skills. The points accumulated by all teams within their Tier will be added to the points accumulated prior to Tiering to determine the final playoff standings. A scheduling Meeting will be held Saturday December 8th @ 1pm at the Sharon Arena (Canada Room) to set up the schedule for the last 12 games for each team. The Ice Scheduler for each Centre will select the dates and times for these games. The head coaches will not attend this Schedulng Meeting. There aren't any playoffs for these divisions. The regular season began on Friday, December 1, 2018 and ends on Saturday, March 23, 2019. As per OHF, OMHA and League Regulations "the use of the BLUE puck is MANDATORY in all SRLL I.P. and Tyke games". All SRLL I.P. and Tyke teams are to use the two (2) minute Buzzer for line changes as per League Regulations. players at this crucial introductory stage. 2. 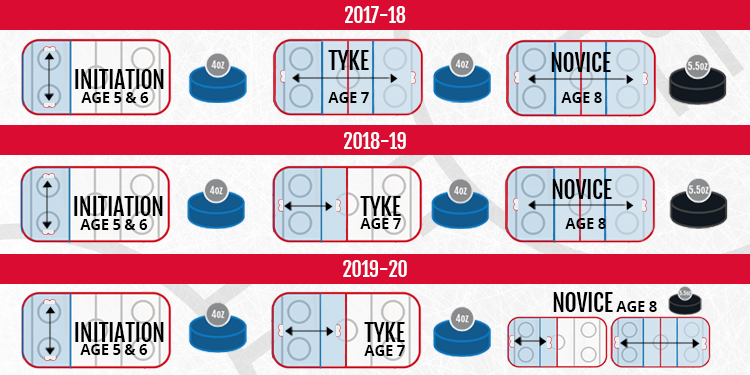 Effective 2018-19 - Game play for the Tyke age-group (7 year-olds) will be Half-Ice. Advise your team delegate to contact the Centre to ask if the IP Jamboree will be tiered because there are varying skill levels for the respective teams. The IP and Tyke Fun Day has been set for Sunday, March 24th, 2019 at the Beeton Arena. Head coaches names are in brackets. Please remember that at the end of your game attend in the Beeton Hall on the 2nd floor of the arena for food and prizes for players and coaches.